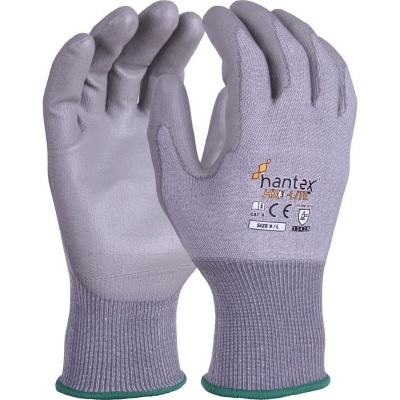 In offering strong grip, protection against a range of mechanical hazards and a high level of flexibility, the Hantex Lightweight PU Palm-Coated Grip Gloves HX3-Lite are a number one choice for handling materials. They are lightweight and flexible which gives your hands the dexterity needed to get a proper hold of goods, while an impressive EN 388 score of 3342B offers strong protection against many of the risks that you may find at work. The Hantex Lightweight Gloves are available in four different sizes, meaning they should be suitable for most users. Please measure the circumference of your hand around the knuckles (excluding the thumb) with your hand open and your fingers together, and the length of your hand from the tip of your middle finger to your wrist.